Thanks to movies, television, and books, the average American has a certain vision of what it means to be a military veteran. But this vision isn’t always based in fact, and the reality is the each veteran’s experience and service is unique. The reason we have this vision is because oftentimes, veterans aren’t always sure how to explain their service, and what it means. Here at Patriot Angels, we are advocates for America’s veterans and are always looking for ways to offer them aid and assistance. Part of that includes communicating with those who didn’t serve. 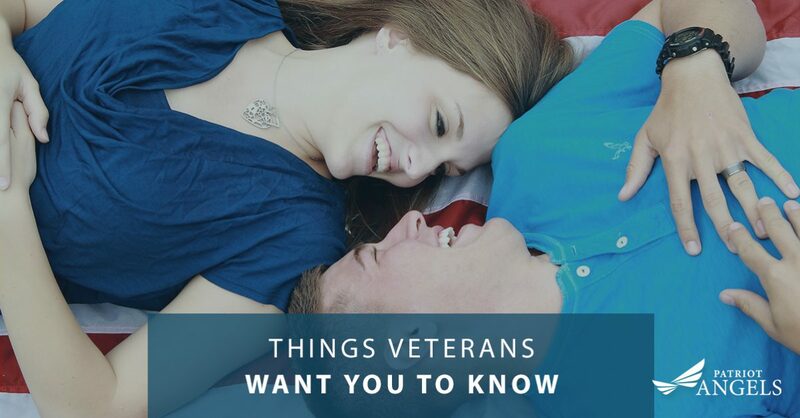 So, here are some things that veterans feel that you should know about them. The United States Military is made up of five distinct branches, each with their own customs, uniforms, missions, and cultures. Only Army service members can be considered soldiers. If you want to refer to veterans or someone who is serving currently, you can refer to them as “service members,” or “military personnel.” Soldiers isn’t a fair way to generalize those in our military, as it leaves out those in other branches who valiantly serve us. For millennia, the infantry made up the majority of any military. Foot soldiers were used to wage campaigns large and small and tipped the tide of victory in many battles. But with the development of modern military technologies, the military has rapidly expanded in scope and in size. Alongside the infantry are tank drivers, helicopter pilots, communications specialists, and even non-combat arms like musicians, cooks, lawyers, and doctors. It isn’t a stretch to say that if there is a job in the civilian world, there is a military equivalent. To serve in the military is a 24/7 job and stays that way for the duration of their service. While some members may have leave throughout the time of their service, they are still at the beck and call of their branch and the nation. That means that at any time they can be called into action. This takes a toll on service members and their families. While much has been made of PTSD and its effects in the last several years, that doesn’t mean that every veteran has it. Many veterans, including those who served in combat, transition out of the military and recover naturally. PTSD can be caused by many different kinds of trauma and isn’t just limited to combat. While not every veteran has PTSD, it is still important to respect those who do and offer them help when you can. Every branch of the military promotes a culture of rugged independence, and perfection. While veterans are used to getting help for tasks or missions while they served, asking for help outside of their service can be difficult, as it often goes against the cultural norms they have grown to expect. When a veteran does reach out to you for help, take their request seriously, as this is a major step for them. At Patriot Angels, we want everyone to know, veteran and non-veteran alike, that you can find the long-term care you need. We specialize in helping veterans and their loved ones navigate the VA process to get access to the Aid and Attendance Pension. If you need help receiving the kind of quality assistance and care that you or your loved one deserves, don’t hesitate to reach out to us today.